United Launch Alliance operates the Delta IV Heavy, the largest rocket in the American launch inventory. 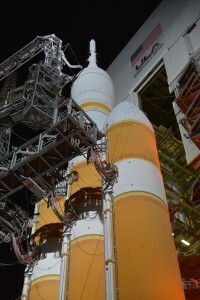 The first stage of the Delta IV Heavy includes three core stages, each one 134-feet-tall and 16.7 feet in diameter. An RS-68 engine is at the base of each core stage to give the rocket a combined thrust of about 2 million pounds. The stage holds super-cold liquid oxygen and liquid hydrogen propellants. The second stage of the Delta IV Heavy is powered by a single RL10B-2 engine that also uses a combination of liquid hydrogen and liquid oxygen. 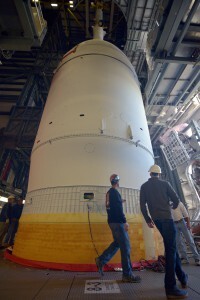 The Orion spacecraft is bolted to the top of the second stage. The Spaceflight Meteorology Group at Johnson says the weather looks good off the coast of Baja California where Orion will descend and splashdown later this morning to end the flight test. 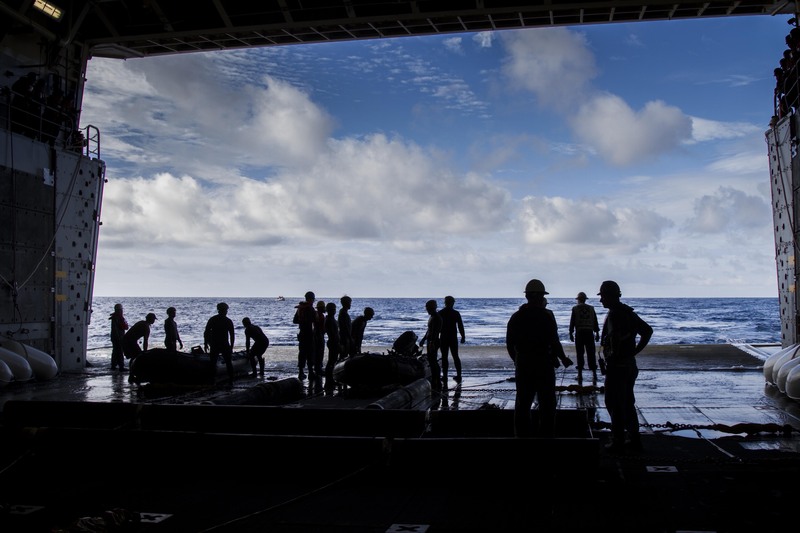 Navy ships are waiting in the area to recover the Orion spacecraft. Orion’s recovery teams prep for end of the mission. The teams of engineers and flight controllers that will conduct Orion’s flight test took their places about an hour ago at consoles here at Cape Canaveral and at Houston’s Mission Control Center at Johnson Space Center. Everything from system checkouts and confirmations to the fueling process is done remotely by the controllers since no one is allowed at the launch pad during this final phase of the countdown. Once Orion leaves the launch pad, Mission Control takes over as it did during Space Shuttle missions. Welcome to Orion’s Launch Day at Cape Canaveral! Good morning from Florida, and welcome to our continuous coverage of the countdown, launch and flight of the Orion spacecraft on its first flight test. 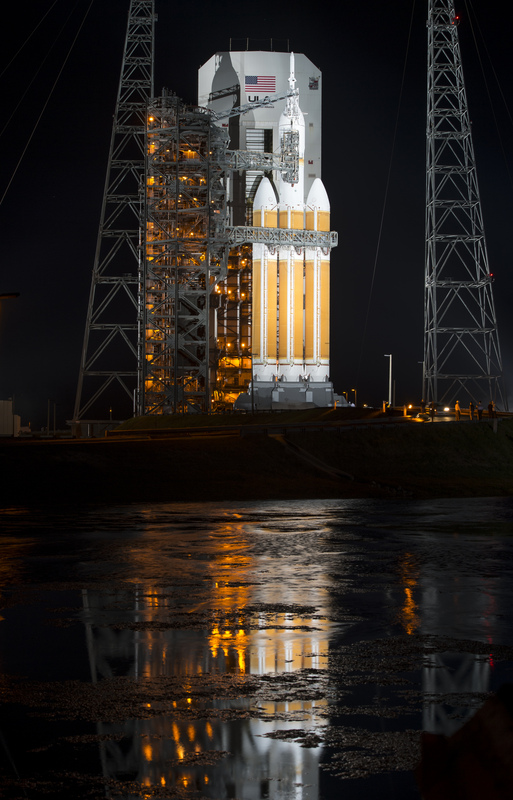 We are 2 hours and 5 minutes from the launch of Orion on a Delta IV Heavy rocket, the largest rocket in America’s current inventory. There are no technical problems reported or being worked at this time and the weather forecast still calls for a 70 percent chance of acceptable conditions when our launch window opens at 7:05 a.m. EST. Between now and then, we will let you know as the Orion launch and mission control teams pass key milestones. 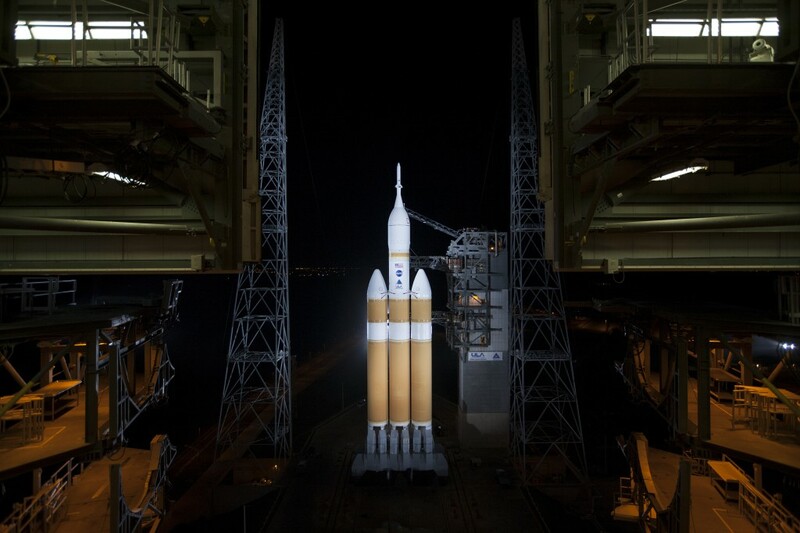 We’ll also give you some context for what this mission means to Orion’s development and to the nation’s ambitions to send astronauts on deep space exploration missions in the future, including eventual flights to Mars. Stick with us throughout the mission, too, because we’ll be here through Orion’s Pacific Ocean splashdown about 4.5 hours after launch. 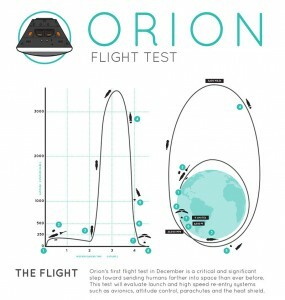 Author Steven SiceloffPosted on December 4, 2014 Categories Orion, Orion Flight Test, Orion-17 Comments on Welcome to Orion’s Launch Day at Cape Canaveral! The launch team has given a “go” for cryogenic tanking. The weather forecast continues to call for a 70 percent chance of acceptable conditions this morning. Meteorologists upgraded their outlook for Orion’s launch tomorrow morning to give it a 70 percent chance of acceptable conditions. The forecast says drier conditions are expected and the chance of coastal showers has diminished during the 2-hour, 39-minute launch window. The primary rules concerns remain flight through precipitation and high winds. With less than 23 hours remaining before Orion begins its first flight test with a launch on a Delta IV Heavy rocket, everything remains on track for liftoff at 7:05 a.m. EST. The Mobile Service Tower enclosing the rocket and spacecraft will be rolled back to its launch position late tonight, revealing the Orion stack on the launch stand at Space Launch Complex 37. 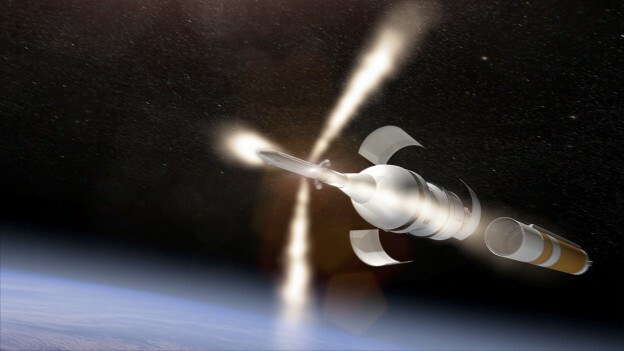 Managers from United Launch Alliance (ULA) and Lockheed Martin gave a “go” to proceed toward launch pending completion of open work during the Launch Readiness Review for Orion’s flight test. The weather is forecast to be 60 percent “go” for a scheduled liftoff at 7:05 a.m. EST on Thursday, Dec. 4. 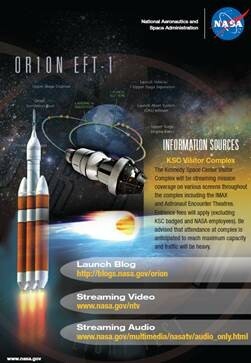 NASA TV will air an Orion Flight Test Status and Overview briefing at 1 p.m. today. On Dec. 3, a prelaunch status briefing will be held at 11 a.m. A NASA overview event with participation from social media followers will air at 1 p.m.
Click for pdf version of information card. Meteorologists have not changed their prediction for Thursday morning’s weather and they continue to call for a 60 percent chance of acceptable conditions for Orion’s lift off on its first flight test. The launch window opens at 7:05 a.m. EST and closes 2 hours, 39 minutes later at about 9:44 a.m. The concern remains early morning precipitation at or near the Florida spaceport. NASA reserved the Eastern Range for Friday and Saturday as well, in case Thursday’s launch opportunity is not made. NASA TV will air to in-depth briefings today about Orion and its place in NASA’s plans to explore deep space including an eventual journey to Mars. Tune in or catch the NASA TV stream at www.nasa.gov/nasatv beginning at noon EST for the Journey to Mars briefing from NASA Headquarters and Kennedy Space Center, then at 1 p.m. EST for the Orion Flight Test Status and Overview briefing. Orion’s Mission Management Team will meet this afternoon to evaluate the status of the spacecraft and go over what steps are left before the mission lifts off in two days. Launch Complex 37 has been cleared of all but essential personnel today so the battery systems that fire the pyrotechnic elements on Orion can be verified. Launch systems use special bolts to connect stages and fairings together as a full launch vehicle. Once in flight though, many of those elements have to separate at different points in a mission, so an electrical charge is used to blow the bolts apart. That allows, for example, spent stages to fall away from the rocket while fully fueled stages take over. In the case of Orion, connectors for the fairing over the spacecraft and its connection with the second stage are also held tight using frangible bolts.